Howdy all I hope your Tuesday is going well. Just a quick one today. I have used the Flower Fancy stamp set from Stampin' Up! 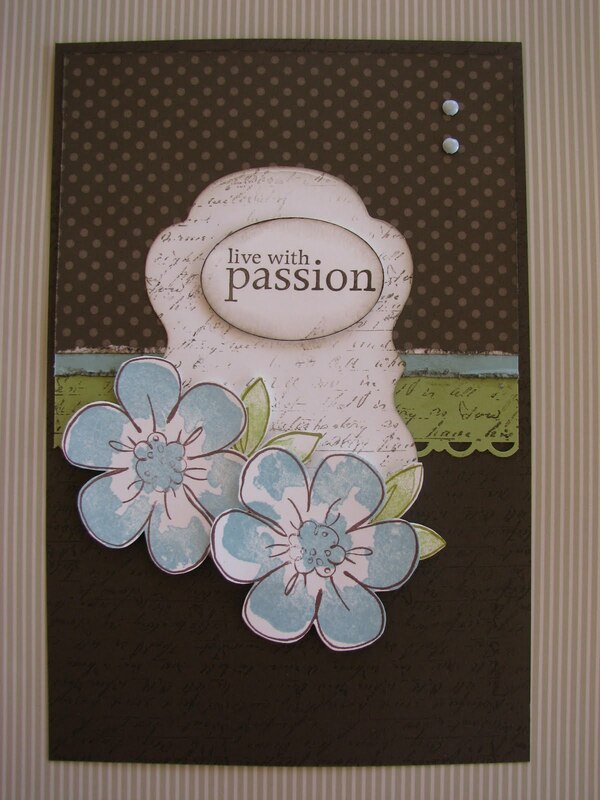 and the sentiment is from Inspired by Nature also a Stampin' Up! set, along with Espresso, baja, and pear. Well I am off to schedule a post for the coming days so be sure to pop back later in the week. Lovely card, nice to see some of your old favourites come back for a visit... flower that is. A great take on the sketch. A sketch doesn't have to be taken literally just to inspire. Thanks for playing at Just Add Ink this week. Lovely colour combo and flower fancy is one of my favourite stamp sets. Thanks for playing along with us at JAI this week! This is just lovely. Love the colours you've chosen for this card. Very nice! I LOVE your take on the sketch and the beautiful colour combo you used. Thanks for playing along this week.